I'll Have a Burger With That Burger? I think it’s the name that bugs me most… the KING QUAD STACKER. Ok, not the most gentile sounding sandwich, not exactly girly. Apparently, there are two, three and a four-layered Quad Stacker. The latter has four slabs of beef, four slices of cheese and up to eight slices of bacon, "smothered," (per Burger King), in a creamy sauce. I’m all for a good burger once and a while, but this gynormous sandwich contains over 1,000 calories and 68 grams of fat (including 30 grams of saturated fat). 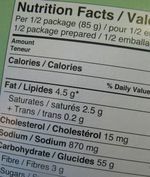 That's about half the calories and 11/2 times the saturated fat the average adult should typically consume in a day. Ouch. #10. "Are my papers in order?" #9. "Can I get it super sized?" #8. "Will I have time to run 298 miles to burn off the calories?" #7. "Could this have anything to do with why the rest of the world hates us?" #6. "Should I talk to my doctor about Lipitor?" #5. "Can I get it on a low-carb bun?" #4. "How come there isn't any sausage on this bad boy?" #3. "Why is Burger King making me sign a release form?" #2. "Should I wait till they come out with the 'Quint Stacker'?" "Do I have my cardiologist on speed dial?" Tags: humor , david letterman , healthy lifestyles , portion control . Figs...an ancient healthy food. According to EattheSeasons.com (whose philosophy is to promote seasonal and therefore more nutritional consumption of food), "the harvesting of figs is depicted in an Egyptian tomb painting from around 1,900 B.C." 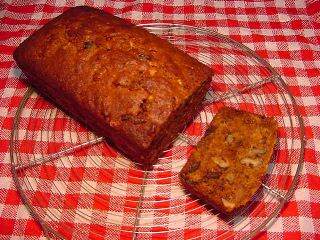 September-October is the time when figs are in full season, and this Seattle Public Health pistachio and fig bread recipe flexibly serves as a dessert, an accompaniment to tea or coffee, or hostess gift. Figs are rich in minerals and a good source of potassium, manganese and iron. They also contain vitamins A, B and C and a decent amount of fibre. So see just what the Greeks, Romans, and and Egyptians have found so irresistibly delicious and nutritious about the fig! A Calorie is a Calorie is a Calorie...Isn't it? That’s true if you’re a bomb calorimeter (a device used to measure the energy [calories] contained in different foodstuffs). But the human machine is a bit more complex. The fact is that we all have individual metabolisms that affect how we use calories, and the end result is that a certain number of calories for one person can mean for another person quite a different thing in terms of body weight. Which is good fodder to support the idea of mindful eating (intuitive, eating). Our bodies’ appestats are designed to tell us when we need calories, and that’s one of the major premises of mindful eating. That we listen to signals from within to tell us when to eat and when to stop eating. Breast Cancer Awareness Month is upon us, and shopping can help support the cause. Shopping and supporting a good cause, it's like chocolate inside of chocolate! Here are some ways to turn your purchases into support. Available in 24 shades. $2 goes to Breast Cancer Research Foundation. Red Envelope, $55 for 10 stargazer stems. 10 percent of sales goes to the Entertainment Industry Foundation Women’s Cancer Research Fund. If you find other goods that do good, please post the “what and where’s” here. 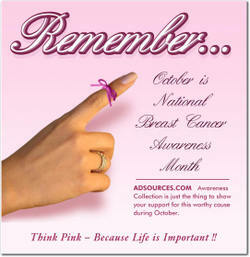 Tags: Breast Cancer Awareness	, Shop for a Cure	, Breast Cancer Research Foundation	, Susan G. Komen Breast Cancer Foundation	. Fighting the Frosh 15 - Should You Care? It’s that time of year again. The kids are off to school...whew! But, for those of you sending your sons and daughters off to college for the very first time, that’s a whole new level of stress! You may be familiar with the term ‘the freshman 15’ but, hopefully, your kids are not. There’s enough for them to stress about isn't there? Recently, I heard someone close to me discussing this potential problem with her daughter and I cringed. Why set her up for one more thing to worry about? Don’t our young women struggle enough trying to meet the unrealistic standards of beauty that our society forces upon them? And could college be any more of a breeding ground for body image distortion as it is? It may be inevitable that some freshman men and women will gain weight their first year in college. But should we stress them out about it? The fact is, the infamous 'frosh 15' may not be a reality at all. But, like many colloquialisms, it has found its way into our vernacular. It is a fact that many young men and women will initially experience some trouble balancing their weight along with all the lifestyle changes they face at college. Dorm food, late night snacking, stress, lack of sleep, time management and the lack of structure all contribute to changes in eating and physical activity. In an article at kidshealth.org, they share that Researchers at Cornell University actually discovered that students gained an average of 4 pounds during the first 12 weeks of their freshman year - a rate of gain that is 11 times higher than the typical weight gain for 17 and 18 year olds. Importantly, though not everyone is destined to gain a full 15 pounds. A multi-year study by researchers at Tufts University found that, on average, men gain 6 pounds and women gain 4.5 during their first year of college. I can live with that and hopefully they can too. If your child is one of those who is really struggling with their weight what can you do? For more information on young women and disordered eating you can check out the Young Women’s program at fitwoman.com for advice and additional resources. Tags: freshman 15 , nutrition , healthy lifestyles , positive body image . Not everyone who visits this blog or comes to Green Mountain at Fox Run, does so because they want to lose weight, some look for a little inspiration and some are just looking to feel good again. But sometimes when we have our weight on the brain, expectations around getting healthy can get skewed. Making just minor positive changes in our behavior, our thinking and creating an intrinsic love for the new way we’re living can be as good for our health as just about anything we could do. The improvements we make don’t have to rock our world overnight, in fact, they shouldn’t. That’s why it’s so important to remember that increases in activity and subtle healthy changes in your diet can add significant benefits to your overall health and well being - even if you haven’t seen the needle move on the scale - just yet. So, don’t be so hard on yourself, understand and accept your successes. Every step you take to improve your health and well being is good for you – even if you can’t see it right away. Tags: mindfulness , fitness , healthy lifestyles , perfectionism . Despite the name, Oktoberfest usually starts mid-September and lasts until October 1st. In Vermont, Stowe is hosting a two-day 'Bavarian Blast' (September 22 - 24, 2006). Todays recipe features a traditional German dish called Bavarian Beef and Beer Stew, (from YourRecipes.com). So, if you can't get away to Germany or your local Oktoberfest this year, make this festive meal a celebration at home with family and friends. Crock pot enthusiasts can also use this recipe. For a variation, try adding a few small cubed potatoes as well. Cut beef into cubes. Combine water, beer or broth, tomato sauce, onion, sugar, vinegar, salt, cinnamon, bay leaf, pepper and ginger in a large pot or dutch oven. When boiling, add the cut-up beef. reduce heat, cover and simmer until meat is tender, about 2-1/2 to 3 hours. discard bay leaf. If desired, thicken juices with a paste of cornstarch and water. serve on a bed of cooked noodles or rice. Note: you can also simply combine all ingredients into a crockpot on high for 1 hour, then simmer for 2-1/2. The summer was tough for me. My hairdresser was always gone when I needed her. Bad hair days are awful, and when they go on for weeks because you can’t get a good haircut, well, it can get pretty scary. But if that’s the worst thing that I have to deal with, I’m doing well. One of the times my hairdresser went missing, she could be found at the Kripalu Center for Yoga and Health. She actually owns and operates a wonderful day spa nearby and really practices what she preaches. She’s been to Kripalu several times for various reasons, but this time she was there to learn DansKinetics. I was pleased to tell her that as part of its program to transform your life, Green Mountain at Fox Run has been offering DansKinetics as a movement therapy for several years now. Our fabulous movement therapist Teri Hugo Hirss offers DansKinetics on Monday nights, at the beginning of the week when many women are just starting their stay at Green Mountain. After 34 years of seeing women come through the doors not quite sure they’re ready to start the journey that Green Mountain represents, the staff agrees that Teri’s class is transformational. It quells anxieties and helps participants connect with their bodies in a way that no standard physical activity class seems able to do. If you can’t make it to Green Mountain any time soon to experience Teri’s class for yourself, check out DansKinetics teachers in your area. You’ll not only get a great workout, you’ll really enjoy doing it. Now that’s something to strive for! Okay, you caught me. I needed an excuse to use my favorite photograph taken while on a Green Mountain Vermonting (hike) a few years ago. Robert Frost’s home that inspired so much of his poetry – considered the voice of New England – is in nearby Derry, New Hampshire. And since one of my favorite pastimes is contemplating my navel in natural settings, Mr. Frost and I have become fast friends. It’s understandable that The Road Not Taken would put you in mind of “health” and “weight loss”. For many years I kept taking the same path that led to a non-stop roller coaster (diet) and only stopped when it crashed into a funhouse with the body distortion mirrors. Once I stopped staring at the mirror, I eventually ended up on that same path, and this time I took the road less traveled, and it has made all the difference. Have a great fall afternoon, without distortion. Tags: Health , Weight Loss , Robert Frost , Roller Coaster Diet . In a post just last week I reported that Madrid Fashion Week organizers were banning models that they perceived to be unhealthy (at a BMI of 18 and under), from participation in this years fashion shows. I commended their efforts. However, an important piece of that story was missing. It seems that much of the concern around very skinny models emanated from the unfortunate death of a young model, Luisel Ramos, a 22-year-old model from Uruguay, who reportedly died of heart failure on the stage during Fashion Week in Montevideo, South America. It is after this incident authorities from Madrid instituted the ban. According to noted fashion designer Jesus del Pozo, the decision was made as part of a voluntary agreement with the Madrid regional government. It would have been much more uplifting a story had someone not died on the catwalk to get everyone’s attention. In a follow up this week, British Culture Secretary, Tesse Jowell, a member of the British Cabinet called Saturday for organizers of London Fashion Week to follow their Madrid counterpart and ban super thin models as well. They declined. But in more positive news, Colin McDowell, creative director of the Edinburgh Scotland’s annual fashion shows told Alastair Jamieson, Consumer Affairs Correspondent of The Scotsman, that he wanted to use "models who speak of glamour, not anorexia". Mr McDowell said fashion designers will always choose taller and thinner women to show off their clothes, but that models should not be "excessively underweight". Consequently, they are embracing the ban. Reportedly, Milan is set to follow suit. Currently, the average BMI of catwalk models who participate in runway fashion shows is 16. The World Health Organization identifies underweight as a BMI less than 18.5. Tags: BMI , under weight , healthy lifestyles , catwalk . The picture above was taken from an article referenced in spotlightingnews.com.